my mother-in-law found this gem of a recipe and brought them over for one of the many desserts we had for thanksgiving this year. i don’t have much to say but PUMPKIN. and BOURBON. and ICE CREAM. 1. blend a third of the ice cream, pumpkin, milk, and bourbon at a time in a blender until smooth, adding sugar and spices to the last batch. pour into a large bowl and stir to combine. 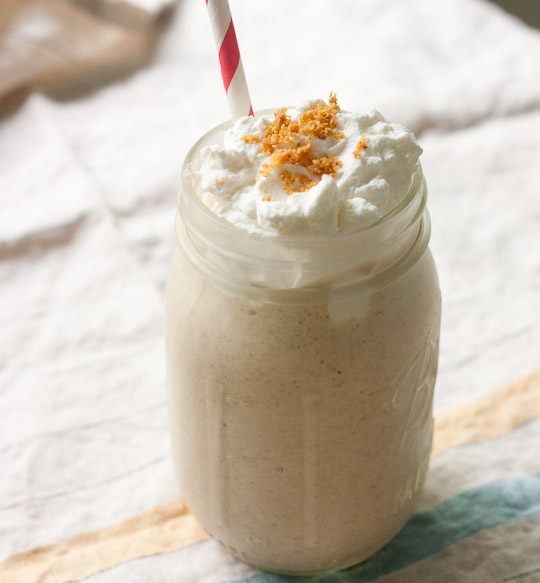 2. ladle milkshake mixture into 8 tall glasses and top with whipped cream, if desired, and a dash of nutmeg on top. note: to make ahead OR if you are wanting a thicker milkshake – do step 1 up to one hour ahead & freeze in an airtight container. stir well before ladling into glasses. ok, i know… i know. all i post these days are sweets. but honestly it’s ALL i can think about and all i ever want to eat these days. i made this last week for girls night and i’d like to say we all couldn’t shove it into our mouths fast enough, but i’m pretty sure i was the only one. oh, and my friend audrey who may have had one or two drips of deliciousness on her shirt after dessert. and on her chin. 1. preheat the oven to 375. in the microwave, melt 1 tbsp of the butter. place the pound cake cubes in a large bowl and pour the melted butter over them, toss to coat. spread the cubes on a baking sheet and bake for 15 minutes, until toasted. 2. melt the remaining 4 tbsp butter (half a stick) in a large skillet. add the nectarines and cook over medium-high heat, stirring occasionally, until the nectarines are slightly softened, about 5 minutes. add the brown sugar and stir to melt. remove the skillet from heat. add the bourbon and the lemon juice. tilt the pan slightly and carefully to ignite the alcohol (this is if you have a gas range; if you have an electric range, use a long-handled lighter). cook over medium heat until the nectarines are softened a bit more and the sauce has slightly thickened, about 10 minutes. take off heat and let the sauce cool for about 5 minutes. 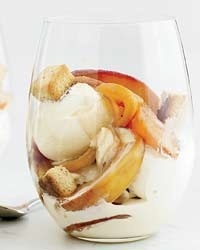 3. in 4 small bowls or stemless wine glasses, put about 1-2 large scoops of ice cream and spoon the nectarines & sauce on top. garnish with the croutons and serve right away. *buy or bake a pound cake, cut it into thick 1/2 inch slices and then cut into cubes. **dear pregnant ladies & those cooking for kiddos: don’t worry about the alcohol content; it all burns off during cooking.